Knotwood products provide the beauty and warmth of wood without the time consuming maintenance and expense. It boasts the aesthetics of wood with the performance and maintenance-free qualities of aluminum and can be used in a wide variety of exterior building applications. The Randolph Rose Collection is a family owned and operated company that specializes in handmade bronze garden sculpture, statues, fountains and accessories for home, garden and public spaces. Hyundai L&C is the leading manufacturer of natural quartz surfaces with the most advanced, nature-friendly manufacturing plant in Korea and North America. 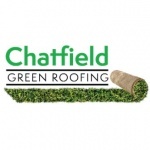 Chatfield Green Roofing specializes in vegetative mat products designed specifically for installation on building roofs across the United States and North America.